Customer Satisfaction is the number one priority of our business. We at TravelCarma define our success based on the level of success our clients achieve by using our solutions. We have a proven track record of enabling hundreds of travel businesses across the world attain their business goals, whether it’s getting online, automating their bookings, reducing their operational costs or maximizing their revenue potential. Here’s what some of our satisfied customers have to say about us. We selected TravelCarma after rigorous vendor selection process. We needed a lot of modules from flight, hotels, tours and activities to unique ones like Free and Easy bookings. The challenge was to aggregate from several XML suppliers, especially with ones with primitive technologies. We communicated our plans and ideas to TravelCarma, and their experienced team rapidly brainstormed all the cases, asked questions, shared knowledge and sometimes argued and finally provided the most accepted solution. After checking out major hospitality technology solutions providers in the world, we have chosen TravelCarma as most affordable solution for our business as best value for money system. One of the most important benefits that we received with TravelCarma is great number of pre-integrated suppliers so we were able to connect in great speed and start our business without delay. With forthcoming and most professional personnel that always stand at your disposal we highly recommend TravelCarma as amongst the best in travel technology. We are a new established company entering into the travel industry. TravelCarma has not just provided us with knowledge beyond the understanding of the systems but furthermore an information and advice about the travel business. We are Satisfied with the service and excellent software system of TravelCarma. The relationship we have with our account manager throughout communications gives us reassurance that all our support needs are dealt with promptly. We have been using TravelCarma for a few months now and their attention to detail both before and after the system delivery has been just amazing. We always get a fast response to all our questions and they are very easy to work with. Our productivity has gone up considerably since we started using their system. Their team has helped plug the holes in our business processes and they have streamlined our business to a large degree. Moreover, their price is absolutely great considering the value they provide, as compared to other vendors in the market which don’t offer the same value for money and can be quite difficult to work with. After a process of evaluating several vendors, and the solvency and experience we received from the sites that use TravelCarma were the factors that made us select TravelCarma for our Online Bus Reservation Portal needs. TravelCarma was a very fast in implementing the application. Most of it was plug and play software application. TravelCarma has a great capacity to adapt. In our project, the challenge was to make it to operate in the Latin American market. This goal was quickly achieved by TravelCarma by customizing the application in a very short time. For our business, TravelCarma intrinsically brought business rules that streamlined the operations of carriers of passengers. I am delighted to share with you how great experience this has been working with you guys so far. After several training sessions with your staff, I can tell you that I´m really impressed with the quality and depth of your solution, as well as the professional support we have been receiving from all your team members. I really enjoy the professional setup, the training methodology and personal touch. I will not hesitate to recommend you and look forward to start operating. A particular recognition to the account manager and implementation manager who have gone beyond our expectations to setup and navigate us through the whole process. Look forward to many years of collaboration and great experience for our customers and agents. I would like to first thank TravelCarma for helping us realize our dream of creating the first dynamic hotel reservations portal in west of Africa. TravelCarma has not only been very helpful, but very prompt in responding to our queries. Their support accessibility is phenomenal despite of the distance between us. Whenever I called for help I surely knew it was on its way. I found it easy to talk to them rather than other providers that I dealt with. Our account manager was not only very friendly, but also made us feel special every time we reached out. I would definitely recommend TravelCarma to anybody from personal experience. In the sense of understanding how the business works, they are always there to give you tips and guidance. I am very glad today that I choose to work with them. They are very trustworthy. TravelCarma has proven to be a valuable resource for our company. The features and flexibility of the product along with the expert advice and support from the TravelCarma team has allowed us to drastically improve the efficiency of our reservation processes. We have been using TravelCarma for over two years now and the process has been simple and painless to switch from our previous systems. Customer service from TravelCarma has been very good and what excites us the most is the potential to further streamline our administration and ultimately help deliver better service to our customers as we further integrate our operation with TravelCarma. One of the benefits we were rewarded with was of not having to jump in the deep end from the start, allowing us to adapt to our procedures over time with the system, which has been seamless to date. We are a travel company in Greenland trying to gather all the tourist activities nationwide in one website. We found it really difficult to find ONE system that was able to plan accommodation, activities, and flight and boat trips. A lot of the programs we looked into were strong in one area and weak in the others; the few systems strong on all areas were too expensive for us. So we were very pleased when we found TravelCarma, it is affordable and it can handle all the above mentioned criteria. And it is easy to navigate in the backend even for the complex functionalities. Beside this they have a great service and a great energy! We engaged TravelCarma to provide us with a B2C platform to enhance our ability to offer our customers an easy way to find, review and book our tours and other services. We are now enjoying the functionality and benefits of the platform such as, organizing of our tours, easy tracking and multiple automatic reports among other benefits. Being thousands of miles away, support at TravelCarma is second to none as daily conversations and ideas exchange makes us feel like TravelCarma is the IT department in my business. We continue to grow with TravelCarma. You Too Can! Get ahead with TravelCarma. 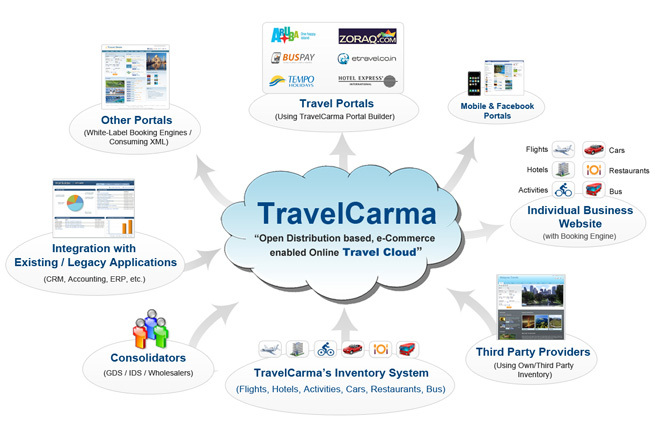 We have been using TravelCarma for over 5 years for serving our large retail customer and agent base. They provide a really useful and scalable booking platform for flights, hotels and activities, developed after a lot of research in the field of tourism and includes several travel management features required by companies like ours. TravelCarma has a great team that is most helpful and quick to respond and service our needs. They have often gone out of their way to support us which is why we have stuck with them for so long. We strongly recommend them over other providers. The new version of the booking system of TravelCarma with various functions is great. The quotations manager, hotels de-duplication, and the map based search options are so strong functions from B2B business prospective. Their B2B system is easy to understand and saves a lot of time of our agents. I gambled peanuts and got a Boeing 407. I've worked with many, many technology companies over the years, and I would rank TravelCarma as one of the most insightful and strategic teams with whom I've partnered. I have been extremely impressed with TravelCarma. In a highly specialized technology industry, they seized quickly on the opportunities and issues in our business and put together a comprehensive plan for our OTA needs. Their high-energy and analytical skills allowed them to present to us a completely different way of looking at one of our business segments, and we are now leveraging their talent across the rest of our company. We are very pleased with their results! I can definitely say that I'd recommend TravelCarma to anyone. The team was critical to us dissecting the consumer insights to be able to develop a new co-brand platform that will allow us to grow beyond our current space. Additionally, their knowledge of travel domain and end users has been extremely valuable in our development of the OTA. Overall, I really enjoy working with TravelCarma team. They helped us create great value for our clients. We have been using TravelCarma for over 3 years and we will definitely recommend it to other agencies. Travelcarma is a modern Travel Agency Software with all the features a Travel Agency needs for driving their online business smoothly and efficiently. We have been using their system for Hotels and soon we are planning to go ahead with flights. TravelCarma has strong expertise in XML API integration and they have a large number of suppliers connected with their system. Their solutions are really helpful for any travel agency in managing their entire business online. TravelCarma played a major role in launching our brand. They provided amazing technical assistance and built our website from scratch. They also fulfilled all our complicated and custom requirements. Their team responds fast and welcomes new requirement requests with amazing delivery. Their support team is proactive and on many occasions have fixed issues even before we reported them. They provide everything an Online Travel Agency needs at an affordable price.